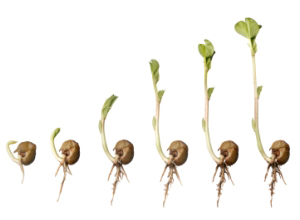 Seed germination is a basic growing skill that involves causing a seed to sprout. Germinating a seed is very easy to do. This guide will explain what germination is, along with some of the most popular germination methods. A few conditions must be present in order to properly germinate a seed. You will need proper Temperature, Moisture, Oxygen, and Darkness. There are many different methods for germinating seeds, some prefer certain methods over others, but so long as you provide the basic requirements you should succeed. 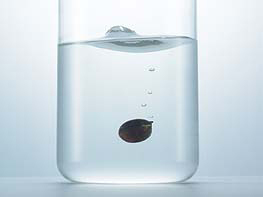 Initially, the seed absorbs water by wicking moisture through the seed coat into the seed itself. Moisture essentially brings the seed back to life. Once enough moisture has been absorbed by the seed, the exterior of the seed cracks open. At this point, the radicle emerges from the seed and forms into the root. The hypocotyl, or stem of the germinating seed, elongates and pushes the the cotyledon above ground. The cotyledon is the part of the seed that forms into the first leaves of the seedling. You may notice when the seed first pokes through the soil that its shape resembles a ‘shepard’s crook’. The plant does this to protect the cotyledons as they push through the soil, which is a process called skotomorphogenesis. Upon exposure to the light, phytochromes within the leaves trigger the process of de-etiolation. At this point, the ‘shepard’s crook’ will straighten (photomorphogenesis) and the plant begins to produce chlorophyll. There are multiple germination methods to choose from. They are all easy to do, although you may find that some growers are adamant about using one method over another. You don’t want it to get too hot, you want to keep the temperature between 70-80 degrees or so. If you don’t have a source of heat, that’s okay, but you can expect your seeds to germinate quicker if you provide them with elevated temperatures. Fill the cup with about an inch of distilled water. You can use non-distilled water, but make sure it is filtered and free of chloramines. Drop the seeds into the cup and place the cup onto your seedling heat mat. Make sure the cup is in a dark area! Light can have a negative effect on the germination process. A heat source isn’t absolutely required, but it will help speed up the germination process. You want to raise the temperatures a few degrees above room temperature, 70 to 80 degrees is ideal. First, before you do anything else, you need to prepare your rockwool cubes. Rockwool is known to have an unstable pH. Check our How to Prepare Rockwool Guide for more information. Once your rockwool is prepared, poke a hole in the rockwool. Make the hole is just large enough for the seed to fit. The hole should be about 0.5” - 1.0” deep. Drop the seed down and close the top of the hole. Don’t pack the seed down in there and don’t seal the hole up too tight. Just close it enough that light can’t get in. Try and get the taproot to face up, but if it faces down it won’t make a big difference. The plant can figure out which was it up, so it will correct itself if it isn’t facing the right direction at first. It’s one of the wonders of nature! Make sure you adequately soak the rockwool, you want it to be pretty wet for this process to work correctly. Spray the interior of the tray and dome with the spray bottle and replace the dome. The goal here is to keep the humidity high. The methods I covered aren’t all inclusive by any means. 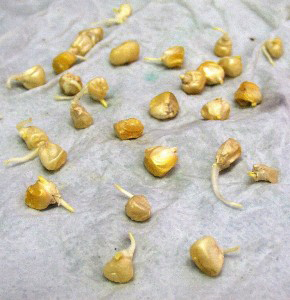 There are many other ways to germinate seeds that I didn’t go over. The methods mentioned above are some of the more popular methods, plus they are pretty simple and straightforward, which makes them ideal for an amateur grower. Feel free to experiement and try different methods yourself. It’s hard to mess up germination as long as you provide the four basic requirements: Moisture, Heat, Oxygen, and Darkness. Good luck germinating and happy growing!